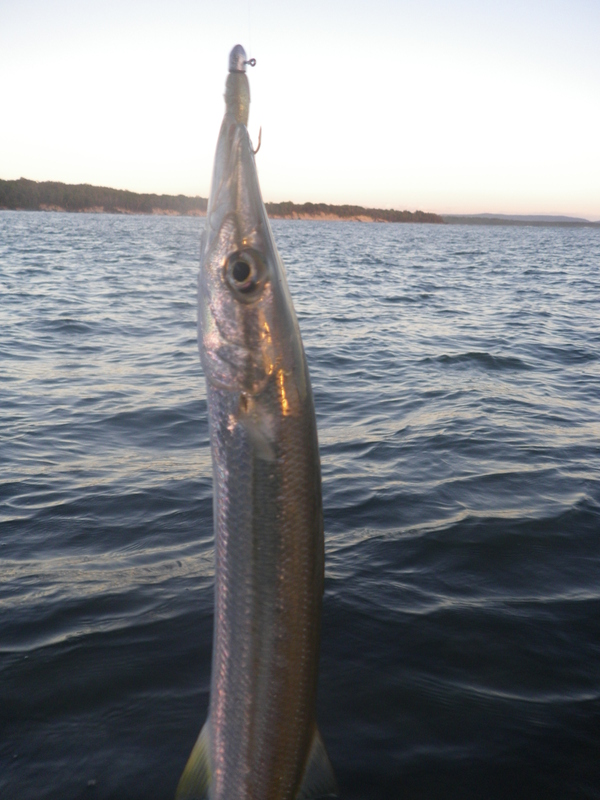 Ok, I once again apologise for an ancient report on last winters’ fishing at Iluka, but better late than never. I managed to get down there for a few days with my kayaking friend, Andre. Conditions where prefect with a very light swell and not much wind so we managed to spend plenty of time out fishing in all my favorite spots. Andre fished in his Kayak while I focused on the rocks. I caught a range of species from the usual dart, bream, tailor, trevally and flathead, to the less usual tuskfish and what looked like a small queenfish. The jewfish/mulloway were hard to find but I eventually caight a small one off the rocks at Frasers Reef. I was mainly fishing with light leaders and soft plastics and then switched to a heavier leader and slug or lure, around dawn and dusk. As usual in this spot there were a few big runs, bent jigheads and straight bite offs. Andre managed some good fish out front in his kayak, including a decent snapper that grabbed a big deep diving minnow hard bodied lure. This spot never ceases to amaze me! Friday was my last morning in Iluka. The weather had been good for fishing – light winds and swell. But it had been miserable for camping, with endless rain showers and no time to dry out in between. Fortunately, I had been in a cabin. A big south-easterly blow was forecast for the weekend and on Friday morning; it was already about 15 knots on the Woody Head platform. The seas had not really picked up yet but it would be too hard to cast from ‘ the Barnacles’ so I decided to give the Shark Bay rock platform a try. This is a great spot in a south-easterly wind, as you can cast off the north tip with the wind behind you. I arrived just after 6.00 am. The sky was fairly clear, initially. Low tide had been at about 3.40 am. The wind was blowing hard so it would only be possible to fish on the north edge and cast to the north-west. These were perfect conditions to get some long casts out of some hard bodied lures. I knew there might be some big fish around but I have really enjoyed fishing with the lighter 10 ft Shimano Catana Coastline Light, this week – so I stuck with it. It is rated 3-5kg, but as long as you have a tough leader and a good drag, it can land some pretty hefty fish. When I break it (which I inevitably will) I will look for a better quality alternative – but so far, so good. It has a poor reputation for durability and most coastal tackle shops have put their fair share of new tips on. Despite this, it is a very nicely balanced rod and I particularly like the way you can feel the action of the lighter hard bodied lures through the tip. I really wanted to catch some fish using my latest favourite DUO lure – the Realis Jerkbait 120SP and the Catana is perfect for it. The Realis Jerkbait 120SP is a clever sub-surface suspending lure that you can get down to about a metre below the surface without too much trouble . It is long (120mm) thin and flat sided, which accentuates light reflection, as it moves through the water and it has both a good slow and fast action. I have had a few of these in some great colours and lost them all to fish. Now I was down to my last one, in a yellow/ cream/ gold colour known as S70 – Dead Ayu. I have swapped the trebles for single hooks, in the hope of hanging on to the lure for a bit longer! I had lost one to a good fish a few days before so I was determined to land something with this one. I cast to the northwest into the choppy, white water. There is a patch of reef that breaks the surface, about 125 metres to the north-west of the rock platform. I aimed at this and with the wind behind me, I was able to put in a very respectable long distance cast. I started the retrieve, jerking the lure along for a few metres, then pausing and allowing it to suspend. There was action behind the lure on the first cast with splashes and surges, but it took about six casts to hook up. I am fairly new to single hooks and my view is that they do not connect with as many fish as trebles do, but once they do connect, the fish stays hooked. That was the case this time and I soon had a 40cm tailor at my feet. I cast straight back out and watched as another tailor knocked the Realis Jerkbait 120SP out of the water but then failed to get hooked. Almost every cast was getting hit. Sometimes I could see the snouts and tails of long toms but usually, it felt like tailor. About 10 minutes after the first tailor, I was on to another better one. This one put on an acrobatic performance with several jumps, before I tamed it. It was just over 60cm and the best of the week. There then followed a good tailor session with the DUO Realis Jerkbait 120SP accounting for six tailor around the 40 to 45cm mark, over the next 20 minutes. It also pulled up a couple of over enthusiastic long toms. At about 7.00 am things went quiet so I swapped to a 65g Raider metal slug. I tried this for about twenty casts with no result, so I swapped to a soft plastic lure. I started with the small GULP 3” Minnow in Lime Tiger, that had proved so appealing to the mac tuna. I put it on a ¼ oz, 1/0 jighead and cast it out. There were no more tuna but after a few retrieves another good bream took it. I landed it and then caught another. There was another quiet spell so I swapped to a bigger GULP Jerkshad in the Sweet & Sour Chicken colour. The tailor must have been passing through again because after a number of bites, pulls and aborted runs, I hooked up again. It was another 40cm fish. The tide was now almost up to my waist so it was time to retreat. It had been a great session and good way to end the week. Bream, dart, tailor, tuna, trevally and flathead – another great week of fishing in Iluka. I have managed to sneak down to Woody Head for a few days and even though there are plenty of showers around, the wind and swell forecasts look pretty good for some rock fishing. On Monday I awoke to a cool, light south westerly wind. It was a morning high tide at about 7.00 am. The new moon is due on Wednesday. I could not go far as the family are with me and they apparently think that fishing is not the only activity on offer here. I decided to have a fish around the rock bars on the edge of Woody Bay, in front of the Woody Head camp site. I was fishing with my light spin rig – a 6’6” Loomis GL 2 rod and Shimano Stradic 2500, 6lb Fireline and 10lb fluorocarbon leader. I started with Gulp 2” Jigging Grub soft plastic in the Pumpkinseed colour, on a 1/8th oz, 1/0 jighead. The tide was a fairly big one and by first light it had almost submerged all the rocks in the bay. I had not bothered with my waders, as the water was fairly warm. This was a mistake – as soon as my shorts got wet, the light south westerly had me chilled to the bone. After a couple casts, a fish grabbed my plastic, next to one of the rock bars and took off. It made two good runs before I tightened the (loose) drag and subdued it. It was a handsome tarwhine, just over 30 cm long. I took a few pictures and threw it back. A few casts later, I felt and saw a long tom try to grab it. I swapped to a GULP 3” Minnow in the Banana Prawn colour – gold and grey with a black fleck. I felt a good bite, then another, then I was on to a fish, a biggish Pike about 35cm long. I put that back and carried on. The long toms kept grabbing, but I could not hook one. At about 8.00 am I connected with a small fish that turned out to be a very small trevally. At 8.30 am I gave up and went for a hot shower. With a lunchtime low tide and clear skies I decided to go and have a look out the front of the Woody Head platform, with my Shimano Catana Coastline light combo. This is a good rod, heavy enough to land school jewfish, but still light enough to feel the bream bite. I use it with a size 3000 Shimano Sustain reel and 16lb Super PE braid. I started with a 15lb leader. The water is fairly clear and the swell was very light. I decided to start big and colourful and put on a GULP Jerkshad soft plastic, in the Lime Tiger colour. I attached it to a ¼ oz, 2/0 jighead and started fishing. The first cast produced nothing but on the second a fish grabbed the plastic and ran with it for a few seconds, before dropping it. As is often the case, it had struck very close to the rocks. On the next cast the same thing happened. I swapped down to a smaller soft plastic – the GULP 3” Minnow in the Lime Tiger colour. This did the trick and I pulled up a bream – just under 30 cm. In the next 5 casts a caught 2 more, about the same size. Then things went quiet. It was about 3.00 pm and the wind had turned south easterly and was blowing a huge rain cloud in my direction. I caught a small dart and then decided to give up for the day. As I cleaned the bream for supper, the resident wobbegongs soon appeared. In the end there were five, swimming around trying to figure out where the fish blood was coming from. I had not caught any big fish but I had dinner – not a bad start to the week. It rained hard over night and I actually woke up cold on Tuesday morning. I made a huge mug of tea and fished out a long sleeve t-shirt. It was just after 5.00 am. The wind had already moved round from the south-west to blow from the east, but it was still fairly light. Low tide had been at 4.13 am. The swell might have eased a little overnight so I decided to start on the rock platform, out front at Woody Head. I walked out to the ‘Barnacles’ in the pre-dawn and things looked promising. There was only the occasional wave coming over the top and I would have an hour or so to fish before the tide got too high. It looked like it would even be possible to put out a few casts in front of ‘Barnacle Bob’. The day before I had noticed the 20lb Fireline had started to fray on the heavy rod and I had lost a fair amount of the 10lb Platil Millenium braid, on the light rod. The Platil braid was getting a bit water-logged and heavy and not casting well. I decided neither was working particularly well in these conditions, so I drove into Big River Bait and Tackle at Maclean and asked for some suggestions on re-spooling. They were all a bit fed up after the floods. The Clarence River was still black and smelly and logically the fish looked like they had all fled out to sea for a while. The Clarence is a huge system and it will be a couple of weeks before the river improves. As usual, the team gave me some good advice and suggested I re-spool both with 20lb Super PE braid. This would be thin enough to cast well on the light rig, but robust enough to handle a decent fish on the heavy rig. Best of all, they stripped off the old line and re-spooled both reels while I went off for a Pot Belly Pie (a local speciality) and a coffee. So back at Woody Head the next morning I was fishing with perfectly loaded reels. This makes a huge difference when casting in difficult conditions. Every line change takes a little getting used too but the Sunline Super PE was a massive improvement. I started with the heavy rod and a GULP Jerkshad in the Lime Tiger colour on a ¼ oz, 3/0 jighead. I moved out carefully over the rocks to a spot just in front of ‘Barnacle Bob’. This has been the scene of a couple of big fish captures for me and whenever it’s safe I try a few casts here. I put the lure exactly where I wanted it but after five or six casts I had not found anything. I swapped through a few more soft plastic colours, but these did not produce any interest. I moved south along the front of rocks to a safer spot and swapped down to the lighter rod. I put on a 1/6th oz, 2/0 jighead and tied on a 12lb fluorocarbon leader. I decided to try a different soft plastic lure. I have never been a fan of the pure white lures, I have always assumed they are an offshore, deep water idea. But I had a packet of GULP jerkshads in white and I was not having much luck, so I decided to give them a try. It was a wise choice; I cast out wide and let the lure waft in on the swell. I left it as long as I could and it got snagged. I re-rigged with the same set up. This time, right at the base of the rocks, I felt a bite, dropped the rod down and then struck. I had a fish. I let the swell wash it up. It was a nice Bream, well over 30 cm long. I cast out again and felt another bite, but did not hook up. I carried on for a few more casts, using exactly the same technique. About five minutes later at 6.15 am I felt a gentle tug and then a solid bite. A wave came crashing over the top and I thought the fish was gone but as the water drained, the line was still tight. On the next swell I tightened the drag a little and pulled hard. A school Jewfish came into view. It had a bit of fight left in it and I only had a 12lb leader so I let it swim back out again. The next wave was a big one and it washed the fish over the rocks and back, past me into the drain behind me. I waited for the water to drain away again and when it did the fish was stranded and I grabbed it. It was the first school jewfish of the week and it had been lurking right at the base of the rocks waiting for dinner. It was no monster at about 50cm long (NSW size limit is 45cm) but it would make a good meal. I despatched it and put it in a keeper rock pool. I looked for more and fished for another two hours but could not find any. I lost plenty of gear trying to get my lures into the strike zone but as the tide rose and the wind picked up, it became harder and harder. At about 8.45 am the water was sloshing over the rocks with every surge and I had to retreat. I went back to wash clean up the jewfish. I gutted it and had a look in the stomach. 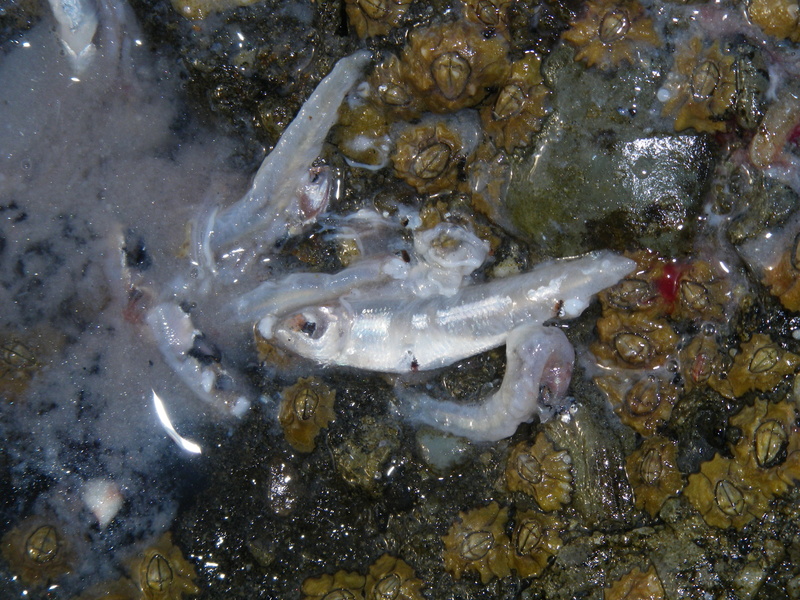 It was full of the tiny whitebait I had seen jumping by the rocks. As I was doing this I was standing in the shallow rock pool. After a few minutes of cleaning and scaling, I nearly jumped out of my skin as I heard a loud snap and splash, just behind my heal. I found a big hungry wobbegong already in attendance. It had swum up a series of very shallow rapids to reach the pool, just below where I had lay the jewfish. The blood and guts had attracted him. I hopped out of the water and quickly found another (stranded) patch of water to finish the cleaning. By the time I finished cleaning the bream there were four of them swimming around, like toothy puppies waiting for lunch. I had cut off the bream’s head as I intended to pan fry it on my camp stove. I left it on the edge of the rock pool and was amazed as two of the wobbegongs wriggled out of the water, in their attempts to reach it. Eventually the bigger of the two lunged forward and inhaled the head, with a loud snap. In the afternoon I came back to the same spot as soon as the tide would allow, at about 2.30 pm. I fished all through the afternoon but the swell and wash made it difficult again. I caught one good Bream, about 33 cm and dropped a bigger one, both on a smaller GULP 3” Minnow in the Banana Prawn colour, on a 1/6th, 1/0 jighead, around 3.00pm. There was plenty of bait, jumping, in close to the rocks but I just could keep the lure where I wanted it. By 5.00 pm I was soaked through and decided to give up and head for the wood fire, fried bream and a bottle of red. The wind started a little cool from the south west but was forecast to move round to the east and north east. The tide would be too full to fish the dawn at Woody Head, so I decided to give Middle Bluff a try again. I arrived in the pre-dawn light, just before 6.00 am and immediately set to work with the heavy rig. I started with 3/8th oz, 3/0 jighead and a Gulp Jerkshad in the Pumpkinseed colour. The bommie, beside which the jewfish lurk, was covered in wash and the sweep took a few of my lures in quick succession. I had done too much of this the day before, so I changed tactics. The sun was up and I moved right to the north end of Middle Bluff. I switched to the light rod with 16lb leader and put on a 1/6th oz, 3/0 jighead. I started with a GULP Crazylegs Jerkshad, in the Lime Tiger colour. I could just about cast the lure out, over the edge of the fringing reef and leave it there for a few seconds. Then I would have to quickly retrieve it with a wave, that was breaking over the reef. After a couple of casts, I lost the tail of the soft plastic, so I put on another. Each time I retrieved, small baitfish leapt ahead of the lure, as it approached the reef edge. 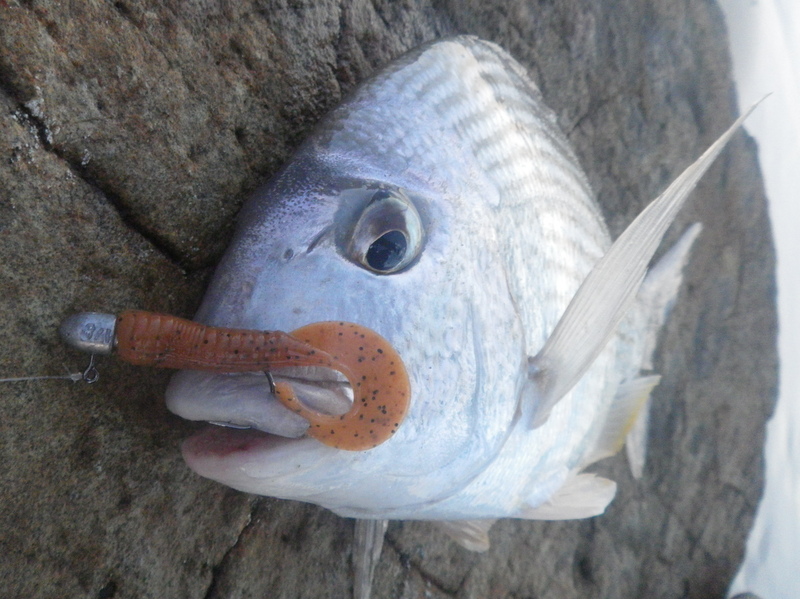 After about three casts, a fish grabbed the lure right at the edge of the reef. I let it have some line and looked for a wave to bring it over the reef. I had not caught much in the few days previously and I was a bit too eager. As the next wave washed over the edge, I pulled a bit too hard and the hook came out. I did not get a good look at it, but I would say it was more likely to have been a tailor or trevally, than jewfish. I threw a lot of lures at this spot over the next hour, with both the light and heavy rod. After about twenty minutes one of my GULP 2” Smelt Minnows was bitten off right next to the edge, but that was it, I did not hook anything else. By about 10 am the water was surging over the rocks too often and I had to move off. The fish were definitely there, but they had again proved hard to get at. By late afternoon the north-easterly breeze had picked up. I decided to try fishing at Shark Bay, to the north of Woody Head. This is another spot that is only really accessible around low tide. The rock platform at the southern end of the bay is exposed for a few hours either side of low. There is a large patch of reef just north of the main platform and the channel between is often a good target area. The sea was fairly flat here. I decided to start with the light rod. I tied on 12lb leader and a 1/6th oz, 2/0 jighead and loaded a GULP 2” Minnow in the Banana Prawn colour. I cast north and waited for the lure to sink. As it did so,…….bang, it was hit on the drop. The Shimano Catana Coastline bent over and took the lunges. After a few runs I reeled in another good size bream. A few casts later I pulled in a tiny Moses Perch and then I started to lose tails to some rapid hit and run attacks. I decided to put a bigger lure on and loaded a GULP Crazylegs Jerkshad. On the first retrieve it was slammed. I knew it was a tailor from the mad head shakes. I wound in steadily and soon had it by my feet. It was about 40 cm long. Over the next hour I had several more plastics mangled, but could not hook up. At one point I saw a couple of long toms following the lure in. At about 7.00 pm, exhausted, I gave up for the day.